Welcome to fatherhood, Mahershala Ali! 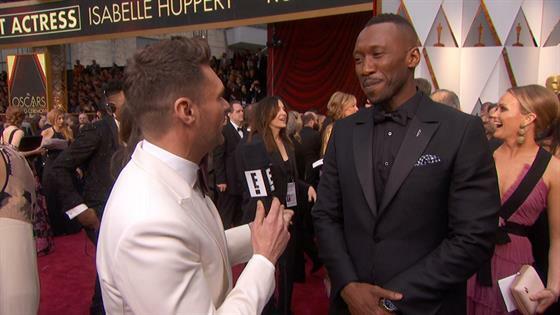 Ali, who's nominated tonight for Best Supporting Actor in Moonlight, stopped by E! 's Live From the Red Carpet at the 2017 Oscars to chat about how he's juggling life with a newborn daughter. "I'm a special kind of tired right now," he revealed to Ryan Seacrest. "It's amazing though. I'm very grateful. It's been a good time." The actor, who welcomed his first child with wife Amatus Sami-Karim on February 22, also shared he started to get concerned when she didn't arrive on time. "She was late, she was running late," he joked. "But she's here and healthy and happy." In addition to his acclaimed performance in Moonlight, the Oscar nominee also managed to fit roles in Hidden Figures and Netflix's Luke Cage into his busy schedule. "I actually felt like I had to do it," he explained. "I just had a good feeling about the projects and how they fit together and the challenge of it itself. I think I'm pretty good at compartmentalizing and really being focused on the thing that I'm doing at that moment and it worked out. I'm really grateful for that experience. I worked with some terrific directors and writers in that time as well, none better than [Moonlight director] Barry Jenkins and I'm here now." All that hard work obviously paid off!